Cupcakes are sometimes piled so high with frosting that you can't really enjoy the cake. Use a flat, matte frosting if you prefer a balance of cake and icing. Royal icing, commonly used for decorating cupcakes, dries to a hard, matte surface that works particularly well for coloring because light doesn't affect it. On your cupcakes, use a slightly thicker royal icing than you would for cookies; thin frosting can run off domed cupcake edges. Beat powdered sugar with egg whites and lemon juice until stiff to make the frosting. For every 2 cups of powdered sugar, you need 1 egg white and 1 teaspoon of lemon juice. Mix the ingredients in a chilled mixing bowl with an electric mixer, using chilled utensils. Color the frosting with coloring gel or powders to avoid thinning it out too much as can happen with liquid food coloring. Add the frosting to a decorating bag fitted with a round decorating tip. If you don't have decorating bags and tips, you can use a plastic food storage bag and snip the corner to create a round hole. Squeeze the bag to pipe the frosting around the edge of the cupcake, creating an outline for the matte frosting. Repeat this step with the remaining cupcakes. Squeeze the remaining frosting back into the mixing bowl. Thin it out slightly with more lemon juice and egg white. If you need to make a new batch of frosting, use 1 1/2 teaspoons of lemon juice and 1-1/2 egg whites for every 2 cups of powdered sugar. If you drizzle some of the frosting in the bowl, the frosting ribbon should stay on the surface for several seconds before disappearing in the rest of the frosting. Spoon the frosting onto the cupcakes and use an icing spatula or toothpick to spread it evenly, pushing it up to the edge of the piped icing border. The thinned frosting should distribute easily in a thin layer. Set the cupcakes on a tray or plate and allow several hours for the frosting to harden and develop a matte sheen. It may take the frosting overnight to harden, depending on the thickness of the frosting on the cupcake. Depending on how flat you want the frosting surface, you may prefer to simply spread the icing on the cupcakes with an icing spatula and use the thicker royal icing for piping the border. This might be the only option if the cupcakes have a steep dome because thinner frosting won't stay on the cakes. 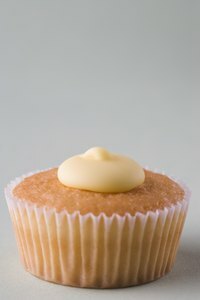 If you prefer not to use raw egg whites in the frosting, you can substitute meringue powder and warm water. You'll need about 1 tablespoon of meringue powder and warm water for every 2 cups of frosting to achieve the thicker consistency and a bit more of each to make it thinner.